O God, who surround us with protection through the glorious confession of the Martyrs Saints Marcellinus and Peter, grant that we may profit by imitating them and be upheld by their prayer. Through our Lord Jesus Christ, your Son, who lives and reigns with you in the unity of the Holy Spirit, one God, for ever and ever. Peter and Marcellinus are two Roman martyrs who suffered under the Diocletian persecution, about the year 303; the first was an exorcist, the second a priest. Their cultus was so important that after peace was restored to the Church, Constantine built a basilica in their honor. Their names are mentioned in the Canon of the Mass (Eucharistic Prayer I). According to the 1962 Missal of St. John XXIII the Extraordinary Form of the Roman Rite, today is the feast of St. Erasmus, a bishop in Asia Minor, who was martyred in Campania at about the same time. He is one of the Fourteen Holy Helpers. Historically it is also the feast of St. Blandina, a slave in the second century, who had been taken into custody along with her master, also a Christian. Peter, an exorcist, was cast into prison at Rome, under the emperor Diocletian, by the judge Serenus, for confessing the Christian faith. He there set free Paulina, the daughter of Artemius, the keeper of the prison, from an evil spirit which tormented her. Upon this, Artemius and his wife and all their house, with their neighbors who had run together to see the strange thing, were converted to Jesus Christ. Peter therefore brought them to Marcellinus the priest, who baptized them all. When Serenus heard of it, he called Peter and Marcellinus before him, and sharply rebuked them, adding to his bitter words threats and terrors, unless they would deny Christ. Marcellinus answered him with Christian boldness, whereupon he caused him to be buffeted, separated him from Peter, and shut him up naked, in a prison strewn with broken glass, without either food or light. Peter also he confined. But when both of them were found to increase in faith and courage in their bonds, they were beheaded, unshaken in their testimony, and confessing Jesus Christ gloriously by their blood. St. Marcellinus and Peter are included in the Roman Martyrology, originally a written catalogue of those saints who shed their blood for Christ during the early centuries of pagan persecution. Local churches celebrated each martyr's "birthday" into heaven, assigning the day of their final victory over the world as their feastday in the liturgical calendar. When she triumphantly arose from the catacombs, the Church gradually introduced other great saints, who were not slain for their faith, into the Martyrology as she combined the recorded Acta of both east and west. An official book of the Roman liturgy, its pages contain the names of thousands of our most valiant Catholic heroes and heroines along with a very brief biographical sketch commemorating either their martyrdom or their most enduring accomplishments. If you would like to purchase a copy you can do so at Amazon.com. In Campania the bishop Erasmus was, under the empire of Diocletian and Maximian, beaten with clubs and whips loaded with lead, and afterwards plunged into resin, sulphur, melted lead, boiling pitch, wax, and oil. From all this he came forth whole and sound: which wonder converted many to believe in Christ. He was remanded to prison, and bound in iron fetters. But from these he was wondrously delivered by an angel. At last, being taken to Formi, Maximian caused him to be subjected to divers torments, being clad in a coat of red-hot brass, but the power of God made him more than a conqueror in all these things also. Afterwards, having converted many to the faith and confirmed them therein, he obtained the palm of a glorious martyrdom. He is invoked for intestinal diseases, for his legend asserts that he was tortured by winding his entrails round a windlass. 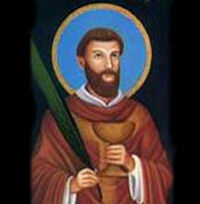 He is also called St. Elmo, and the static electricity on boats, Saint Elmo's Fire, is named after him. He is one of the Fourteen Holy Helpers. Patron: Abdominal pains; ammunition workers; appendicitis; birth pains; boatmen; childbirth; childhood intestinal disease; colic; danger at sea; explosives workers; intestinal disorders; mariners; navigators; ordinance workers; sailors; sea sickness; stomach diseases; storms; watermen; women in labor. Symbols: Windlass or capstan wound with his intestines; ship; ravens bringing him bread; cauldron of molten lead; red-hot armour; three-pronged hook; cauldron of boiling pitch or resin. 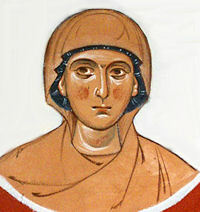 St. Blandina lived as a slave at Lyons, Gaul, in the 2nd century after Christ. She was one of the illustrious company of those martyred under the emperor Marcus Aurelius. She was apprehended together with her master, who was also a Christian. She endured every torment imaginable, to the extent that the tormentors confessed that they could not think of anything else to do to her. And to every question put to her, she gave the same answer: "I am a Christian, and we commit no wrong." Brought to the arena for fresh torments, Blandina was bound to a stake and wild beasts were released upon her but refused to harm her. She witnessed the podvigs (struggles) of all her fellows, and was the last to suffer martyrdom, by being placed on a red hot grate, enclosed in a net, and thrown before a wild steer, who tossed her into the air with his horns. In this manner the great martyr of Christ received her crown.